Join us for a day of sewing at Old Spool and learn how to make the practical and comfortable Carrie Trousers by Sew Over It! 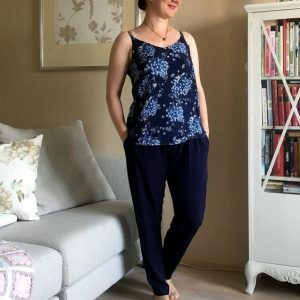 These are a great first time pant project for those who have accomplished a few sewing projects and are feeling confident to get into clothing. There are no closures, only elastic at the back waist for a comfy fit. We’ll sew pleats and slanted pockets and you’ll leave with a great pair of pants appropriate for work or those upcoming Spring days! This pattern will fit from a waist 26”/ hip 36” to a waist 38”/ hip 48″ If you could, please include your measurements when purchasing the class to help us prep your pattern for you! Prerequisite: This is an Advanced Beginner Class, because the garment skills we’re learning are straightforward but it is preferred you are comfortable with beginner projects. Also, the garment fabric required for this project is more challenging. 1 yard of 2” wide elastic. Materials Provided: All sewing machines and notions and a copy of the Carrie Trouser pattern (a $12 value) in your size. Skills Covered: Cutting out a pattern, following pattern instructions, slant pockets, elastic waistband, garment finishing techniques etc.